Extend your HDMI signal up to 230ft with Comprehensive's HDBaseT Extender! Comprehensive's HDBaseT extender, Transmitter & Receiver, can send uncompressed audio/video and IR data over a single run of CAT5e/6/7 cable at a distance up to 230 feet. 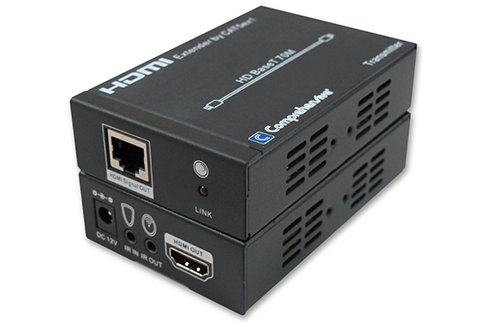 This HDBaseT Extender features the transmission of video, Audio, and Control (IR). This extender supports Transfer of Bidirectional Infared control, allowing for greater flexibility in installations. Supports video signals up to Ultra-high-definition 4k@30Hz, including 1080p@60Hz. POE (Power Over Ethernet) support from either Transmitter or Receiver. POE Power Consumption less than 10W.Supports Consumer Electronics Control bypass. Enclosure made of durable metal. This Extender kit is perfect for Meeting room presentations, Home entertainment, Classrooms, and anywhere in between. All components are RoHS Compliant. 2 Year Hassle Free Warranty. We have no downloads available for the Comprehensive Video Pro AV/IT HDBaseT Extender over CAT5e/6/7 at this time.